Photo: This area holds 3 to 4 breeding pairs of White-tailed Eagles, which represents the biggest density per square mile anywhere in the country. Photographed by Szekeres Levente. Several European Honey-buzzards and several hundred European Bee-eaters are filling the sunny sky above the wetland. I am driving by the Beljarica (a.k.a. 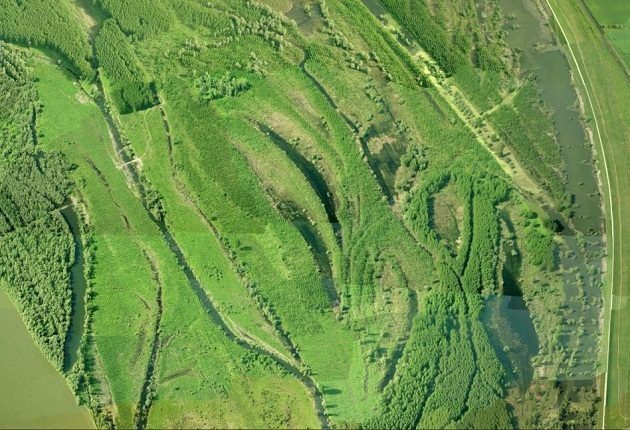 Crvenka) floodplain, north of Belgrade, along the dyke lined by “the cubicles”, a series of square ponds created when the soil was dug to build the embankment. Soon, the cubicles in front of me are paved by a flock of Mute Swans. One Black Stork is soaring above them. The autumn migration has clearly started. The shallows are full of ducks in eclipse, a real puzzle that requires a bit of time and a sharp eye – something you usually reserve for warblers and such. The majority are clearly Mallards, followed by Garganeys, with one and possibly more Green-winged Teals, also Ferruginous Ducks… Surprises among them are one Common Shelduck, a species that most likely breeds some 15 mi from here (and my first shelduck of the year) and an even greater surprise: two Eurasian Wigeons. Wigeons are only migrants and not a breeding species in Serbia and August is a bit too early for any longer distance duck movements. Are these very early migrants or possibly breeding birds of a wider area? Birds in their second calendar year often do not breed yet and spend time further south from their breeding areas, so this is most likely their year off. 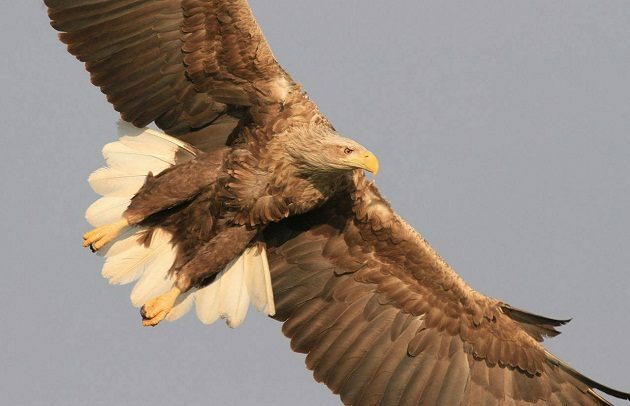 White-tailed Eagles are numerous and I observed five – four of them at once (3 imm. and one ad.). The number of herons and cormorants is clearly falling, but several hundred strong flocks of Sand Martins (Bank Swallows) and Common House-Martins are still around. Okay, obviously a bird-productive area, but what about the title? This floodplain is now pinpointed for total annihilation… or development, depending on your angle of view. 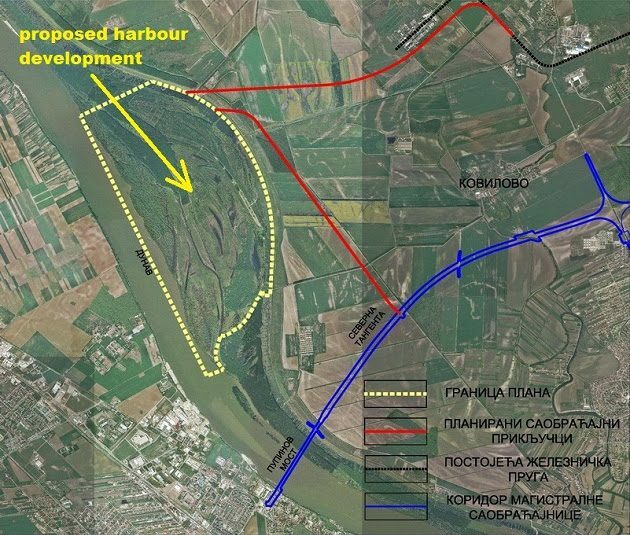 These 870 ha / 2150 ac of river arms, ponds and cubicles, willow and poplar forests, together with alien hybrid black poplar plantations, are earmarked to become the new harbour of the city of Belgrade. Recently, 29 fish species of fish were recorded in this area, together with 8 amphibians, 9 reptiles and 62 species of mammals (including 20 species of bats), together with Wild Boar, Roe Deer, Wildcat, Golden Jackal, Eurasian Otter, European Pine and Beech Martens, Steppe Polecat, Stoat and the Least Weasel. The bird fauna of the Danube backwaters in this area, which represents part of the “Confluence of the Sava and the Danube Rivers” Important Bird Area, has more than 210 bird species and in the last 7 years some 136 of them were recorded in the Beljarica floodplain (find an incomplete checklist here). 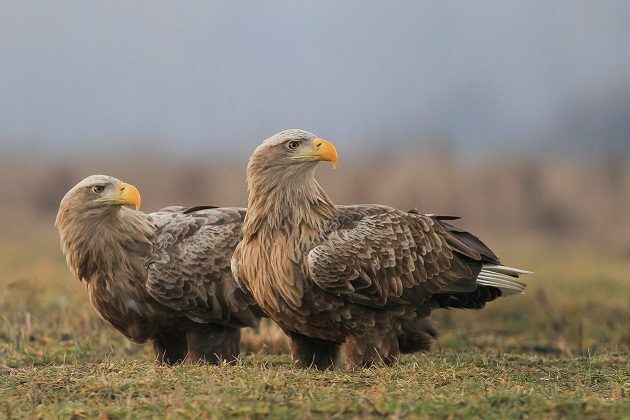 Among them are 3 to 4 breeding pairs of White-tailed Eagles, the largest density per square mile anywhere in Serbia. Other species of special significance are herons and egrets (this is very important foraging area), Ferruginous Duck, as well as Lesser Spotted and European Green Woodpeckers, Spotted Flycatcher and the Icterine Warbler. Out of these 136 bird species, 108 are strictly protected and further 28 protected by Serbian legislation. Furthermore, Annex II of the Bern Convention lists 45 of these bird species, with further 91 species in the Annex III. The Convention on Migratory Species (the Bonn Convention) lists two of these species – the Ferruginous Duck and the White-tailed Eagle – in the Annex I, with further 64 species in the Annex II. Finally, 24 species in Annex I of the EU Bird Directive were recorded in this area (the country is obliged to create SPAs – Special Protection Areas for those species, and this particular area is of national importance for them), with the White-tailed Eagle already seen as the qualifying species to nominate this area for the NATURA2000 ecological network. Lastly, there are 51 Species of European Conservation Concern (SPEC) recorded in this area. Considering the number of species, but also habitats of international conservation concern, protection of this area and its biodiversity is clearly an issue of wider European and not merely local significance. Only two years ago, in the spring 2014, Serbia had catastrophic floods. Water levels were higher that the projected 100 years maximum and entire towns found themselves under 4 m / 13 ft of water. The Beljarica floodplain is a life jacket of Belgrade, capable of absorbing large amount of floodwaters and slowing down the current. I know that first hand – I was birding Beljarica at the time of floods. Water levels were only half way up the dyke, nothing threatening, and Belgrade was spared. A study by WWF shows that by the end of 20th century, more than 80 per cent of such floodplain habitats along the Danube and its tributaries were destroyed. These backwaters are an ecological corridor which renews life as long as it is continuous, but once cut by large scale development, remaining isolated green islands are doomed to lose much of their biodiversity. In order to minimise such impact, there is an international initiative to create a green corridor of protected areas along the Danube. The initiative to protect this particular area was launched in 2010 by the League for Ornithological Action, a local NGO, within the “Wings Across the Balkans” project coordinated by the BirdLife International and supported by the European Commission. Belgrade City Environmental Secretariat accepted the initiative and the Institute for the Protection of Nature of Serbia produced the study and the proposal for the protection of 1860 ha / 4600 ac of the Danube backwaters in 2013. In the summer of 2015, that proposal was scheduled for voting in the City Assembly, but was withdrawn before the vote took place. In the August 2016, this newly planned harbour development inside the most valuable 870 ha of the proposed reserve was announced. Is there an alternative? Until the new bridge next to the Beljarica floodplain was finished in 2014, two harbour alternatives were considered, one in the village of Vinca, downriver from Belgrade, and another one within the city, in the suburb of Krnjaca. No explanation was given why those sites were rejected or why this one was chosen. What is necessary is what law already requires, a Strategic Environmental Assessment, transparent from the very beginning, which would be made by an independent institution or the body of experts whose names must be known to the public. Why is all this of importance? Not only because it defines the future of the international ecological corridor along the Danube and the natural surroundings of the capitol city, but for the political reasons as well: Serbia is at the sensitive moment of its candidacy for the European Union membership, about to open the Chapter 27 on environment and climate change. Thank you for bringing this important issue to our attention before it is too late. After reading your thoughtful analysis, I have written to all of the people on your list to express my concern. Good luck!